I am not recreating the wheel of cheese here but I think I have made making cheese chips easy and tasty. All you need is one ingredient: CHEESE! These chips are so easy and cost way less than the Parmesan chips you get at Whole Foods!! 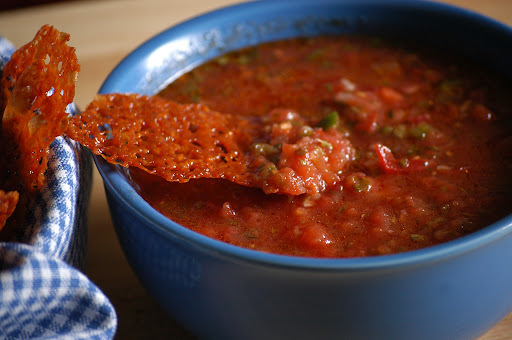 These chips can surprisingly hold up to salsa and dips, just don’t try to dig all the way down to the bottom of the bowl. But to be safe, you could use a spoon for dipping your toppings on to these chips. Preheat oven to 350 degrees F. Slice cheese about 1/8-1/4 inch thick (I used a handheld cheese slicer) and place on parchment lined cookie sheet. Bake for 8-10 minutes then turn off oven and leave for another 5-6 minutes or until slightly brown but not burned. Carefully remove (you can blot oil with paper towel) and cool on drying racks lined with paper towels. Once cool, store in air tight container. For maximal crunch, remove from container right before serving. DO NOT REFRIGERATE!! ** You can also microwave them on a piece of parchment paper until the cheese hardens. Depending on the size of your cheese slice, this can take from 30-45 seconds. For more great recipes, check out Satisfying Eats Cookbook and find me on Facebook. oh yum and sharp cheddar sounds like the perfect chip. I've done this with provolone, but I fold them to make taco shells. Chips and taco shells! Wonderful! I'd like to see both these recipes in your upcoming book! I just found your website and am really excited about trying your recipes. I have one question. I notice that you use almond flour in many of your recipes. I have read pros and cons on almond flour. What is your opinion and how much or often can we safely eat it. Hi Jackie, I hope you enjoy the recipes. My motto is moderation. I wouldn’t eat 3 cupcakes, a batch of waffles and a batch of cookies everyday. I feel these recipes are great alternatives for wheat and grain based foods. I am working on more recipes using more coconut flour for the next cookbook. Thanks for stopping by! I have made these before in the microwave as well. you just slice or grate cheddar onto a parchment lined plate and nuke for about a minute or so. You can tell when they start to lose their gooiness they are getting ready. The are not hard and crispy when you pull them out of the microwave, so you have to let them set up first. This is a good time to fold over if you are making them into taco shells, as someone suggested above. You can control the cooking a little better, and they do not get as brown. I guess the only drawback is if you are making a lot, you have to do them in several batches, because if they get too close together on the plate (if you are doing small ones), they can run together and then you end up with one big one anyway! I haven’t done it in the microwave, sounds easy! Lisa, you can really use any cheese. Hard cheeses, slices of real cheddar, etc. Hope this helps!